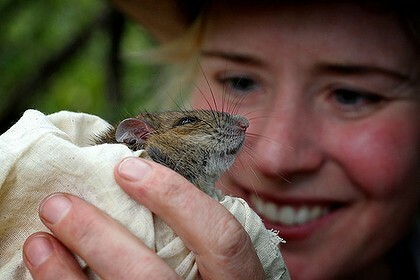 Scientists from the University of Sydney are set to release 100 native Bogul rats in Sydney Harbour National Park, and North Head Sanctuary in Manly, to see how they compete against introduced black rats, which are considered pests. The environmental benefits could be significant because the Boguls, also known as bush rats, or Rattus fuscipes, tend not to climb trees, and are less likely to disturb nesting birds or eat eggs than black rats. Nor do they carry the potentially life-threatening lungworm disease, which can spread to pets, wildlife and people. They are also less likely to invade homes than black rats, preferring the bush. A keen eye is required to distinguish between the two species, as they both have the same grey colouring. University ecologist, Grainne Cleary, said the most obvious difference was the length of the tail. ''Pest black rats have tails that are much longer than their bodies, whereas Boguls have tails that are the same length as their bodies or even shorter," she said. The similarities between the two species could be the reason for the disappearance of Bogul rats from Sydney more than a century ago. During an outbreak of bubonic plague, a bounty of sixpence - about $4 today - was offered for every rat killed. The last confirmed sighting of a bush rat in Sydney was in 1901, and 110 years later the effort to bring back the Bogul has been supported by Taronga Zoo, the National Parks and Wildlife Service and Mosman Council.